The Fahrenheit Group has finalized the results of its comprehensive 2015-2016 Mid-Atlantic Total Compensation Survey for Small and Middle Market Companies. The findings show employer expenses continue to rise for compensation and benefits, but at a modest rate. The size of average actual salary adjustments increased very slightly to 3.1% from last year’s 3.0% actual average, and continues well below the 4.2% average increase in 2008. For 2016, survey participants projected an uptick with an average salary adjustment rate of 3.7%. However, it should be noted, that in most years the actual average increase tends to be less than the projected increase. About one-half of the participants (48%) granted salary increases based on merit or performance based alone, 47% granted salary increases based on a combination of merit and other factors, and the remaining 5% granted salary increases based on cost of living. The Fahrenheit Group is a leading provider of human capital management, organizational effectiveness, training, human resource management and consulting services to the commercial, nonprofit, and local government sectors. The survey collected data from 111 firms with total employment of 10,326 and employment of 6,367 in the Mid-Atlantic region. The survey respondent median revenue was $5.5 million and the median staff size was 34 employees, and 66% of the companies had annual revenue of less than $20 million, reflecting a comprehensive set of total compensation and human resource data for primarily privately-held small to medium-sized firms. The 2015-2016 summary report provides data on base salary, cash incentive, and total cash compensation for 49 key positions; with data provided for companies with revenue of less than $10 million, companies with revenue between $10 and $49 million, and companies with revenue greater than $50 million, in total. Executives are provided the opportunity for annual bonuses in 66% of the responding companies, 32% of the firms provide executives stock options, and 26% of the firms provide them with annual incentives. The number of companies providing bonuses to executives increased from last year, while stock options grants increased and annual cash incentives remained about the same as last year. These and other short and long term incentive awards that are offered to employees appear in the survey by employee level (executives, middle managers, technical/professional staff, sales staff, and non-exempt employees). Nearly all survey participants (99%) provide health coverage for employees and/or families, and cost sharing between the employer and employee increased this past year. In 2015, employees contributed 21% of the total cost for single coverage (vs. 19% in 2014) and 41% of the total cost for family coverage (vs. 35% in 2014). Other common benefits provided to more than three-quarters of full-time employees include 401(k) retirement savings, dental care, and prescription drug coverage. Additional employee benefit plan practices are contained in the survey report. The survey findings also revealed that responding companies embrace flexible human resource practices in a challenging marketplace to recruit and retain staff: 83% encourage casual dress, 76% provide flexible work schedules, and 62% allow employees to telecommute. The complete list of HR Practices is in the report. In addition, this year’s survey reported an increase in the percentage of companies contributing to their employee’s 401(k) plan to 87% (from 82% last year). In addition, the survey reports on health care plans, waiting periods, paid time off and traditional leave packages, company paid holidays, and wellness benefits. 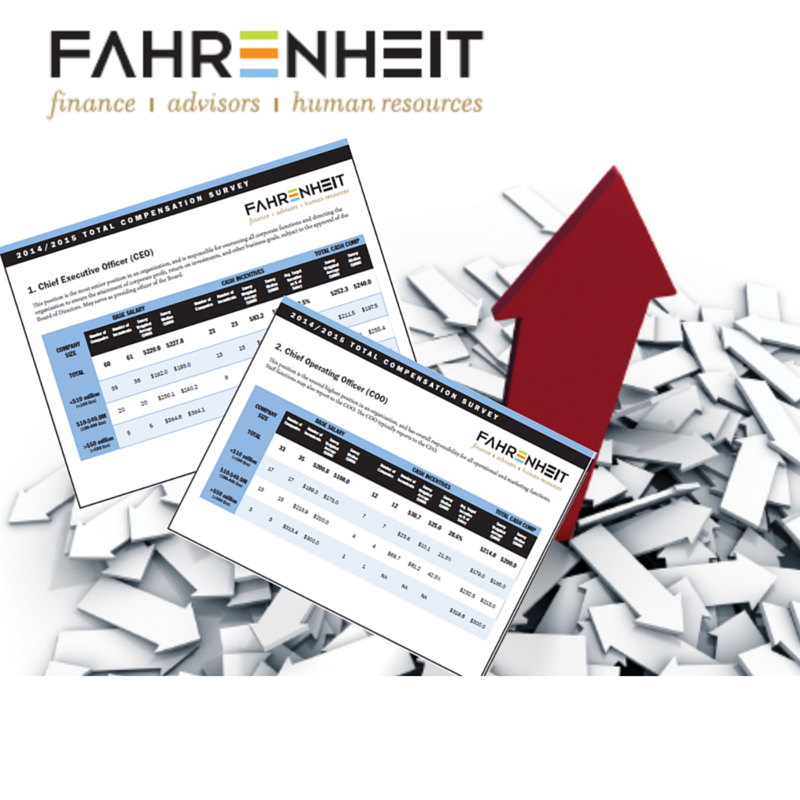 A copy of the summary report is available for purchase at www.fahrenheitadvisors.com for $400. The Fahrenheit Group is a full-service advisory firm that helps growth-oriented organizations overcome their most difficult hurdles to success and challenged companies to find their way. Our team is comprised of senior leaders and consultants with real-world experience in three practice areas–Accounting and Finance, Business Advisory and Human Resources. We leverage the extensive knowledge of our team to understand clients’ true needs and implement practical solutions. Our team of seasoned, C-level executives and consultants collaborate with management and define strategy, building road maps to execute and deliver measurable results. Serving clients across all industries, ranging in size from emerging growth companies to Fortune 500, including angel, VC and private equity backed portfolio companies, we arm leadership teams with the strategy, knowledge, and expertise to inform decision-making and drive value. The Fahrenheit Group’s Compensation Practice serves a diverse range of clients in the commercial, nonprofit and local sectors, including technology, professional services firms, government contracting, software, finance, healthcare, real estate, retail, law, life sciences, manufacturing, and construction.